The former First Lady said Trump was cruel and dangerous when it came to Obama's husband, her children, and Hillary Clinton. Michelle Obama calls Donald Trump’s tactics “bigoted” and “dangerous” in a new memoir. She will discuss her new book and personal revelations in the tome during a sit-down interview with out ABC News anchor Robin Roberts in a special this weekend. Outlets with advance copies of her new book, Becoming, say the former first lady doesn’t hold back in describing her anger at the current administration. 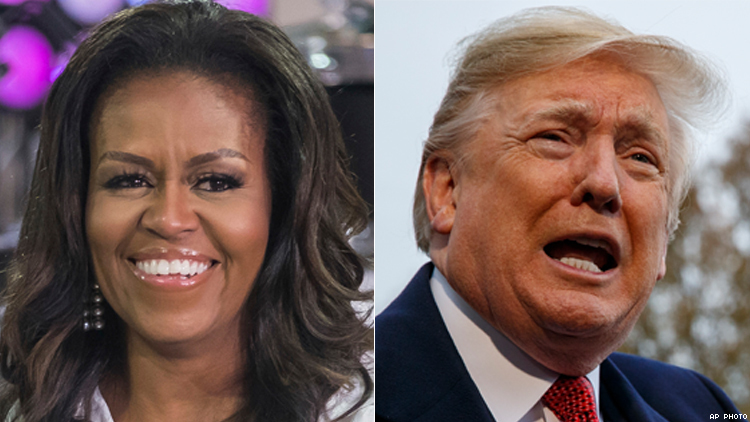 And she says Trump’s “birther” campaign against her husband, President Barack Obama, “deliberately meant to stir up the wingnuts and kooks,” as reported by the Associated Press. The passes all come from the memoir, which will be released on Tuesday. Michelle Obama proved an LGBTQ ally in the White House during her husband’s eight years as commander-in-chief. Even before her husband embraced marriage equality and other issues, Michelle Obama promised to LGBTQ groups as far back as 2008 that her husband would fight for equal rights in the White House. In advance of her special with Roberts, ABC revealed footage of Obama also discussing stereotypes she faced in the public eye.